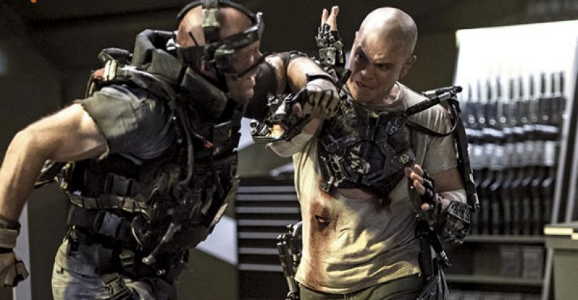 Neill Blomkamp’s Elysium was one of our most anticipated movies of the summer. After all, he amazed us with how far he stretched a $30,000 budget with 2009’s District 9, so the thought of how much he could accomplish with Elysium’s $115,000. And from a visual and design standpoint, he certainly didn’t disappoint, serving up a gorgeously detailed dystopian future world where the rich live on a lavish orbiting space station while the poor wallow in overcrowded misery on the earth below. 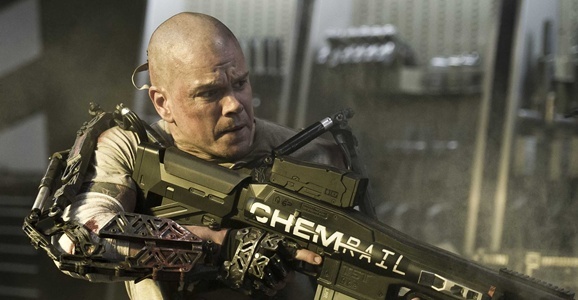 The story itself, starring Matt Damon as a terminally ill blue-collar dude who attempts to infiltrate the titular station in order to use its advanced technology to cure his cancer, didn’t fire on all cylinders the way he had hoped, but we’ll take an ambitious Blomkamp semi-success over most other movies any day of the week. The film is hitting home video today, and if you’re eager to dig into the details and making of Blomkamp’s latest science fiction epic, the Blu-ray won’t disappoint. You can order it from Amazon on Blu-ray or DVD, and we’ve got a breakdown of the bonus features below. 2013 was a good year for science fiction on the big screen, in quantity if not always in quality. Going into the year we had a ton to look forward to. Remember all the contenders we were cautiously optimistic about back at the beginning of the year? Oblivion, After Earth, Pacific Rim, Star Trek Into Darkness, RIddick, The World’s End, Europa Report, Gravity…there was a lot to look forward to. Some were better than we dared hope. Some were just as bad as we expected. Some were exactly what we wanted them to be. And some we’re all still yelling about. Elysium fell somewhere in the middle of the extremes, an entertaining flick that didn’t live up to its predecessor, District 9. If you skipped it in theaters, you won’t have to wait much longer — it’s hitting Blu-ray and DVD on December 17. Set in the year 2154, Elysium presents a sharply divided vision of the future. The wealthy live a life of privilege, free from illness and infirmity aboard the titular orbiting space station. The rest of us live in squalid, miserable poverty on the wasted, overpopulated husk of Earth. Matt Damon plays Max, a worker who is receives a fatal dose of radiation during an on-the-job accident. He could easily be cured on Elysium, if only he could get there. Out of desperation, he agrees to take part in a dangerous mission to infiltrate the station and tear down the metaphorical walls that separate the haves from the have-nots. Elysium, Neill Blomkamp’s follow up to District 9, left many genre fans wanting. It’s not that Elysium isn’t action-packed and fun, it’s just a bit on the nose and heavy-handed with the social allegory, and the world isn’t as well constructed as his directorial debut. But still, Elysium, is worth watching. A new lawsuit, however, alleges that Blomkamp stole the idea and many of the film’s characteristics from another screenwriter. Briggs alleges that “Elysium” infringes on the heart of his “Butterfly Driver” story as well as its plot, characters, unusual settings, themes, conflict, catalyst, crisis, climax-twist, the hero’s unique “character-affiliation,” the hero’s “keepsake necklace” and more. Elysium Coming To Blu-Ray In December, So Celebrate With Concept Art Of…FashionBots? Neill Blomkamp’s Elysium was one of the last big science fiction releases of the summer, and now it’ll be one of the big science fiction DVD releases of the winter. 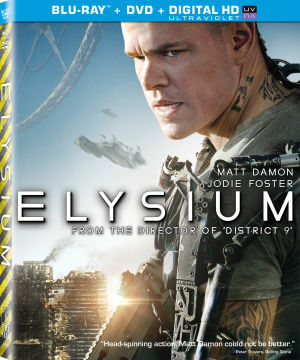 Sony Pictures Home Entertainment has slated Elysium for a December 17 release on Blu-ray combo pack, DVD, and UltraViolet HD digital download. Join us as we celebrate the news with a trip through a ton of concept art from the film — including some unused FashionBots! One of the great things about science fiction in TV, film, or games is that there is inevitably tons of cool behind-the-scenes stuff to dive into. If you want to learn every little detail of how the movie was made, chances are you can do just that thanks to Blu-rays and the Internet. One of my favorite elements to pore over is concept art. It’s always fascinating to see the ways various elements of a property evolved as the story was being realized, both the dead ends and the ideas that made it all the way to the final product in one form or another. Today we’ve got a ton of cool concept art from two of the summer’s big science fiction releases: Guillermo del Toro’s Pacific Rim and Neill Blomkamp’s Elysium. First up, some early designs for Pacific Rim’s Kaiju — the giant critters who emerge from an interdimensional rift at the bottom of the Pacific. The movie’s tagline was “To fight monsters, we created monsters,” and artist Guy Davis was one of the people helping to create the film’s monsters. What’s cool to me about his work is that you can see ones that very obviously were approaching the final “style” for Pac Rim’s Kaiju, but there are also quite a few designs that don’t look anything like what we got in the movie. I particularly like the centipede-looking thing with the four tentacles around its mouth (at the top of this story). You can also read an interview with Davis about working on Pacific Rim over on Legendary’s website.